Test Prep for 6th Grade Math STAAR. 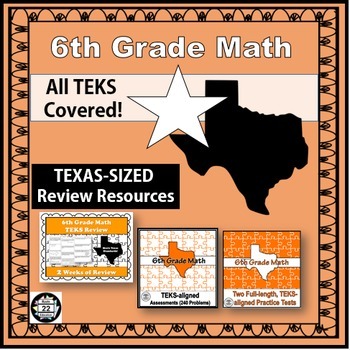 This bundle includes 6th Grade Math Materials to Prepare for the Texas Standardized Test (STAAR)! These classroom-tested materials will help students succeed! Save 20% with this amazing bundle! These products are available for individual purchase in Route 22's store and they are included in the 6th Grade Curriculum Bundle. Please check your previous purchases before selecting this product. Benchmark students with these TEKS-aligned practice tests. There are 52 multiple-choice questions each. An answer key is provided. After students take the practice test, they can analyze their results and plan for success with these data analysis pages. These pages are exclusive to the practice test and this bundle. 2 weeks of spiral review. Four rigorous questions per day focused on the four reporting categories. Answer keys are provided. Go even deeper with these practice problems. There are at least 4 problems for every TEK! This fun activity covers many of the concepts tested on the Texas standardized test. Target critical thinking skills with these simple, yet effective error analysis pages. Sixteen task cards that focus on the Readiness TEKS. Each purchase of this product is for one individual teacher (licensee). The individual licensee can make copies for one classroom only. Please do not share this product with co-workers, grade levels, or within schools or districts without purchasing the appropriate number of licenses. Additional licenses are available on TeachersPayTeachers.com. Licensee may not upload this product to the Internet in any form. For additional information about licenses, please email me at route22math@gmail.com.